According to the Health News Library, you don’t have to wait for Autumn when pumpkins are normally harvested to enjoy their cancer fighting benefits. They write saying that research performed at Tufts University with pumpkins showed that 1/2 cup of canned pumpkin or fresh cooked pumpkin has five times the daily quota for beta-carotene (vitamin-A) per day. If you were able to read our article Curried Apple Pumpkin Soup, and was able to prepare it, you would find yourself with some left over pumpkin. 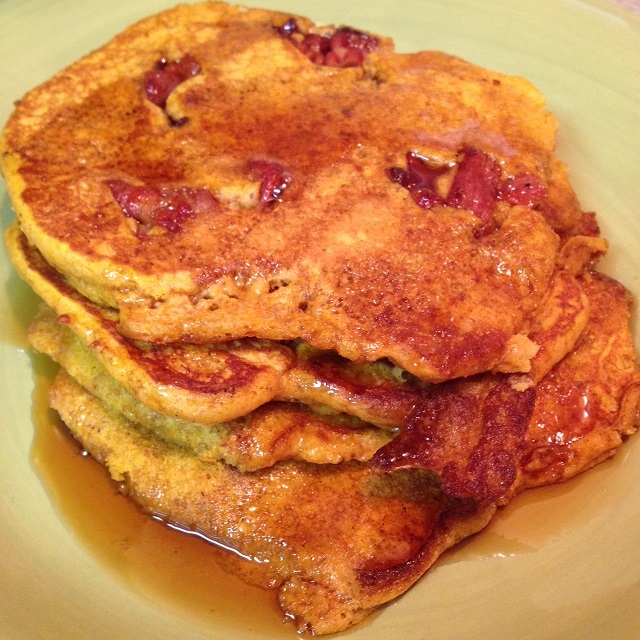 Well, no worries, as the 1/2 can of left over pumpkin can be used in our featured recipe: Pumpkin Bacon Pancakes. Whisk together in a large bowl the first 6 ingredients, and set aside. In a separate medium bowl whisk together buttermilk, pumpkin, eggs, coconut sugar, and coconut oil. Gently stir buttermilk mixture into flour mixture. Heat a cast iron griddle coat with butter over medium heat. Drop heaping tablespoons of batter onto griddle to form a 3 to 4 inch pancake. Drop some of the crumbled cooked bacon. Cook until golden, about 2 minutes each side. Plate and drizzle with real maple syrup. Prevention magazine (October 2012 issue) says, to better absorb the beta-carotene in the pumpkin add a healthy fat to the recipe, and in this case it is the coconut oil. If you choose, you can use olive oil. If you cannot get your hands on some coconut sugar, then you can substitute raw honey. 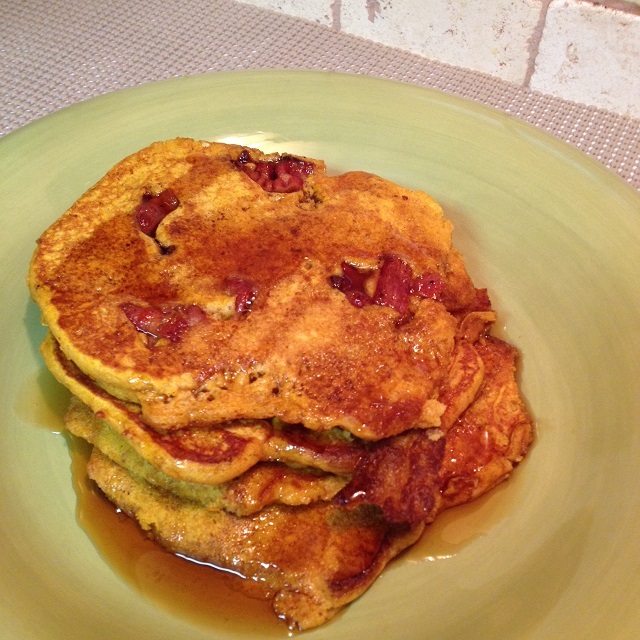 This entry was posted in Breakfast and tagged Apple Pumpkin Soup, Baking, Baking powder, Bread, canned pumpkin, Casserole, Coconut oil, Coconut sugar, Gluten-free diet, pumpkin, Pumpkin bread, Pumpkin pie, pumpkin pie spice, Tablespoon. Bookmark the permalink. Thanks for stopping by Roger and for your interest in the recipe and your comment.